Letters and Papers, Foreign and Domestic, Henry VIII, Volume 19 Part 1, January-July 1544. Originally published by His Majesty's Stationery Office, London, 1903. 279. [The Privy Council] to Wotton. Enclose copy of letters to the King from Mr. Vaughan and Thomas Chamberlayn, showing that Mons. de Bures is yet uncertain where his men are to be levied. The Emperor promised the services of Mons. de Bures with the bands he had; and, afterwards, the Viceroy, being here, promised that De Bures should have the horsemen and footmen he led last year. Wotton shall require the Viceroy to move the Emperor to fulfil this; and, upon opportunity, shall require it also of Grandvella, and even of the Emperor, using with the Viceroy and Grandvella arguments suggested by the enclosed letter without giving occasion to suspect that they proceeded from De Bures. He shall declare that De Bures shall thus do better service, to the Emperor's honor, the King's surety and the common advantage; and that, the King expecting to have De Bures with his bands, if now others, especially of the Low Countries, whom he knows not, be appointed, it will not only make De Bures unable to serve as he intended but "disfurnish a great piece of his Majesty's determination in that behalf." And albeit, for the saving of a little money, the Emperor has been moved (fn. n1) to appoint to De Bures men who are already retained in these Low Parties, the King cannot think that, "either in this matter or the provision for mares and carriage, wherein his Majesty understandeth there is now made some restraint and difficulty, th'Emperor will stick or show himself difficile, but rather that he will see and cause all thing to be frankly accomplished and performed accordingly." Wotton shall have a good eye to the conditions taken with the king of Denmark's ambassadors, who (he writes) are come to treat for peace; and shall require of Grandvella that, as the Scots are manifest enemies, it may be expressly articled in the peace with Denmark "that no aid nor succour shall be given to the said Scots from thence, nor any league, promise or confederation be or continue with the said Scots to the prejudice of his Majesty or any of his Highness' realms or dominions." Draft corrected by Petre, pp. 3. Endd. : Mynute to Mr. Wotton, primo Aprilis 1544. 280. [The Privy Council] to Layton. The King hears from Mr. Vaughan and Thos. Chamberlayn, lately addressed thither, that Mons. de Bures, who is to lead the band sent to the King at the Emperor's soulde, is not yet certain where they shall be levied. The Emperor promised De Bures's service with the band he led last year; and afterwards the Viceroy, being here, promised to solicit that he might serve with the same band; and, if men are appointed whom he knows not, especially borderers of the Low Countries, their service might both discontent the Emperor, who bears the charges, and hinder the common affairs. Layton shall therefore require the Regent and Council that the band to be appointed may be ready to muster at the time the Commissaries, Mr. Vaughan and Chamberlayn, shall determine, and may be appointed of such as De Bures led last year, or at least such as he himself shall choose; pressing them to resolve at once and adding that, as the King counts upon De Bures with his bands, if others, especially of the Low Parts, whom he knows not, are appointed, he shall not only be unable to serve as he intended but it shall "disfurnish a great part of his Majesty's determination;" and, although it may save money to appoint men already retained, yet, for such a saving, either in this or the provision of mares and carriage (wherein the King understands that some difficulty is made), the King cannot think that the Emperor "will stick or show himself difficile." He must remind the Regent and Council of the sending of ships and men to the seas; and not forget "to call for their resolute end touching the declaration of the Scots for enemies." If there is "any difficulty for the having of the lymoners and carriages specified in the rate delivered to George Brown and Broke, you shall with all dexterity solicit that the same may be supplied;" and call earnestly on Brown and Broke to certify what they have done and "what likelihood they see of the full furniture of the same"; so that the King's army be not letted in going forward. Draft, pp. 7. Endd. : Mynute to Mr. Layton, primo Aprilis 1544. 281. [The Privy Council] to Vaughan. The King has received the letters from him and Thos. Chamberlayn, and perceives that Mons. 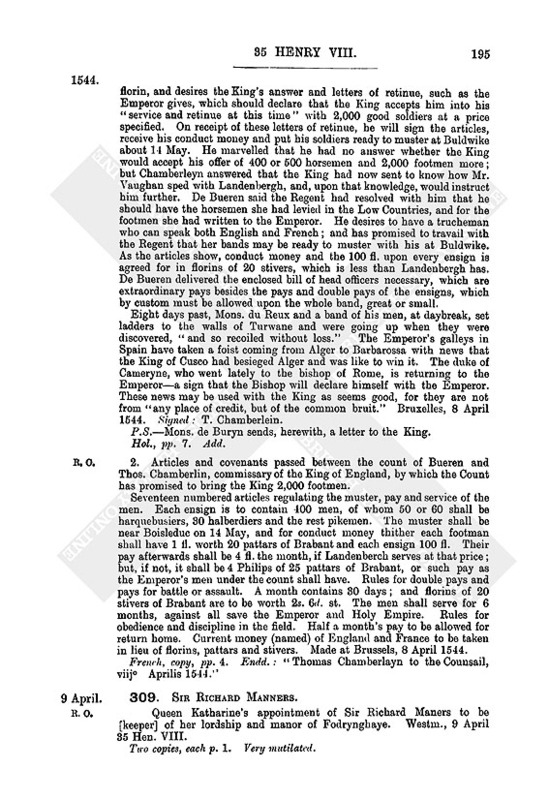 de Bures will not serve at the valuation of the florins in the covenants with Landenburgh (and doubts whether Landenburgh can keep his bargain) and that Vaughan leaves Chamberlayn in the Low Parts and hastens to Spyre and Frankfourth to commune with Landenburgh, &c., as instructed. As the determination with De Bures for the 2,000 men depends upon whether Landenburgh can keep his bargain at the time appointed, you shall use all diligence "to know resolutely whereunto his Majesty may trust at the said Landenburgh's hands," and signify it to Chamberlayn, to whom we have addressed letters, of which we enclose a copy for your instruction. Draft corrected by Paget and Petre, pp. 4. Endd. : "Mynute to Mr. Vaughan, primo Aprilis 1544." 282. [The Privy Council] to Chamberleyn. By late letters to the King from Mr. Vaughan and him it appears that Mons. de Bure, talking of the 2,000 men to be levied by him, said he doubted whether Landenburgh could furnish the men he promised; but if he did he (De Bures) would serve at like wages, although it should be to his cost. As Vaughan is departed to Landenburgh and De Bures awaits the King's pleasure at Antwerp, Chamberleyn shall, upon hearing from Vaughan whether Landenburgh can perform his promise, repair to De Bures and proceed with him for the furniture of the 2,000 men; and if Landenburgh stick to his promise at the covenanted valuation of the florin, but De Bures seem loth to serve, tell him that the King, for his good opinion of him and trust that he will bring picked men, will allow wages for the 2,000 men at the valuation himself required. Enclose a letter from the King to be delivered to De Bures, with thanks for his affection and a desire that he will travail earnestly to have the Emperor's band under him chosen of such horsemen and footmen as were last year in his retinue, or at least chosen by himself; which also the King has presently written to his ambassadors resident both with the Emperor and the Regent to solicit. Draft partly in Petre's hand corrected by Paget, pp. 4. Endd. : "Mynute to Thomas Chamberlayn, primo Aprilis 1544." 283. Hertford, Tunstall, Llandaff and Sadler to Henry VIII. 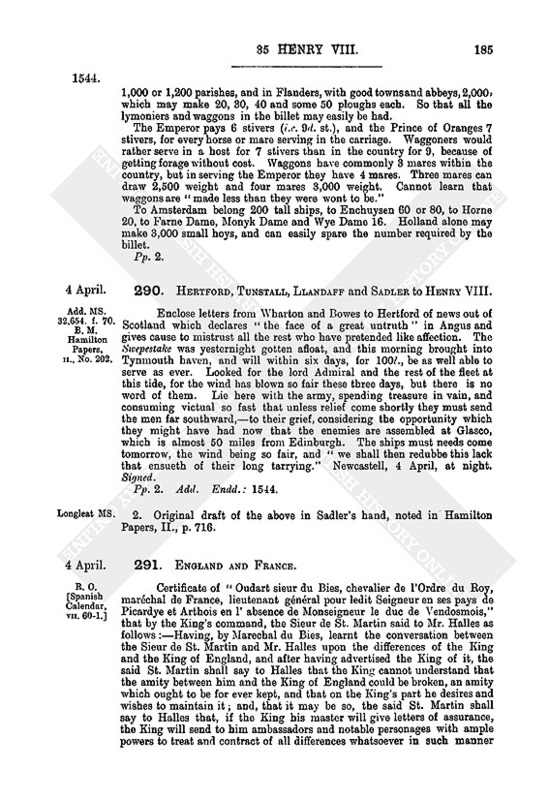 Enclose letters from lords Evre and Wharton, showing espial news of Scotland. 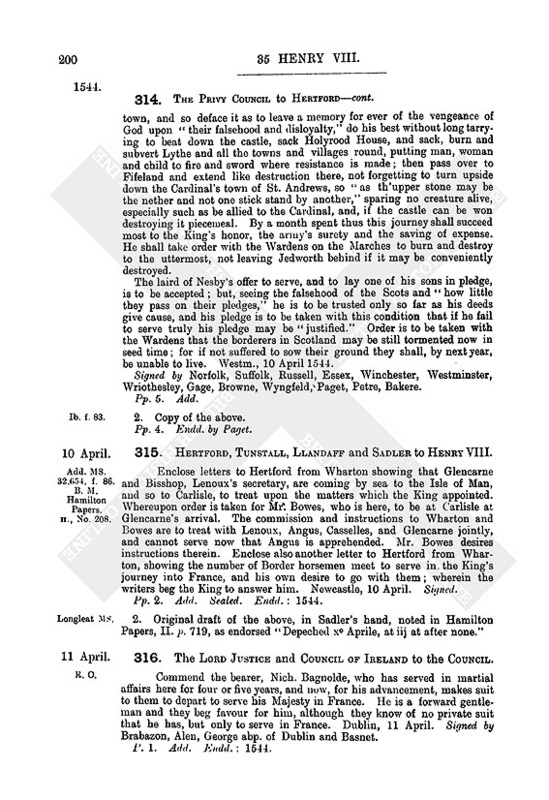 The Council lately wrote to Hertford to make the earls of Westmoreland and Cumberland privy to the resolutions taken with the wardens for the invasion of Scotland, and, in generality, to the enterprise by sea; and commit the defence of the Borders to them while the wardens are in Scotland. This is done, and Cumberland is already removed to his house of Browham in the West Marches, and Westmoreland repairs shortly to Alnwick. Westmoreland was most desirous to be with those who invade Scotland either by land or sea; and Cumberland, to strengthen the West Borders, retains 100 men in his own wages; so that it appears that both are most willing to do service. The earl of Shrewsbury is arrived here, and, although not yet recovered from sickness, is very forward to serve. Are sorry that there is yet no news of the lord Admiral and the rest of the ships to transport the army. Hope that the Swepestake will be saved, wherein the poor man who was master in her travails much. Her great ordnance and artillery and much of her lading is brought safe to land, but the victuals in her are lost. The musters taken by the wardens of the East and Middle Marches show that 700 Borderers and Northumberland men are in the garrison (which now numbers 2,000) to the weakening of the Borders, where they should serve without wages. Will make no alteration until the present enterprises are perfected, Newcastle, 1 April. P.S. in Hertford's hand:—Thanks for the King's "plat." If it be true that Captain Bortwick showed Suffolk at the making thereof, touching Edinburgh Castle, the King shall know that Hertford lacks no good will to get it to the King's "youse" (use). Signed. 2. Original draft of the above without the postcript. In Sadler's hand, pp. 4. Much mutilated (about the half torn off). 284. The Queen of Hungary to Chapuys. Received the annexed letters from the Emperor, with his Majesty's letters of the 18th inst. (fn. n2) by which he remits it to her to make the declaration against the Scots, or still temporise if she sees that the delay does not prejudice the enterprise of France or that Flanders does not receive too much damage thereby, as Chapuys may see by the annexed extract from the said letters. 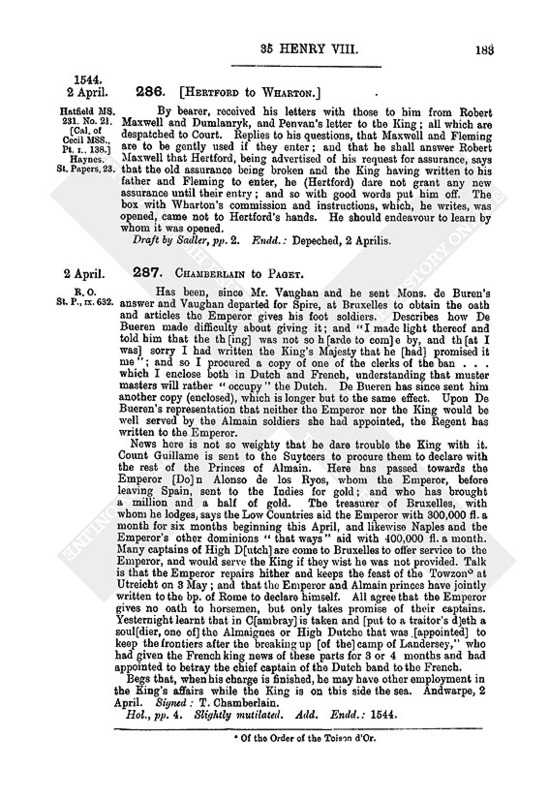 Has answered the Emperor, as appears by the extract annexed, and as she cannot so well as Chapuys know the prejudice to the enterprise of France she remits that point to him and has drawn a minute of the said declaration in conformity with the treaty of closer amity, which he may (if he think fit) communicate to the King's Council or advertise her whether he thinks more fitting to temporise still or to make the declaration promptly; it being understood that, if he finds that, for the advancement of affairs (especially not to cool the enterprise against France) it should be requisite to make the declaration forthwith, he should take assurance that within the next two months the King shall declare against the Duke of Holstein (if the Duke's deputies do not now accord with the Emperor before he leaves Spires), without further delaying under colour of the interests of his subjects, who meanwhile will be able to withdraw their goods. The damage to Flanders by the declaration is so notorious and great that it could not be estimated, as he knows by her last letters, and if war continue with Holstein the entire navigation of Flanders would be lost, and it would be impossible for her subjects to bear it unless the King declares likewise against Holstein, which is the true way to bring him to reason, as she wrote before. Nevertheless, she holds that the English will not insist so much upon publishing the said declaration, because she has arrested all the Scots on account of what she writes to the Emperor, as Chapuys will see by the annexed extract, and now has under arrest more than 150 Scots, part of whom are sailors who have neither baggage nor money to live upon. Has spoken to the English ambassador to rid her of the keep of these poor sailors, and he has consented, provided that the merchants are retained, two of whom, however, shall be sent to solicit deliverance of the English ship taken, upon condition that the others shall answer for them. 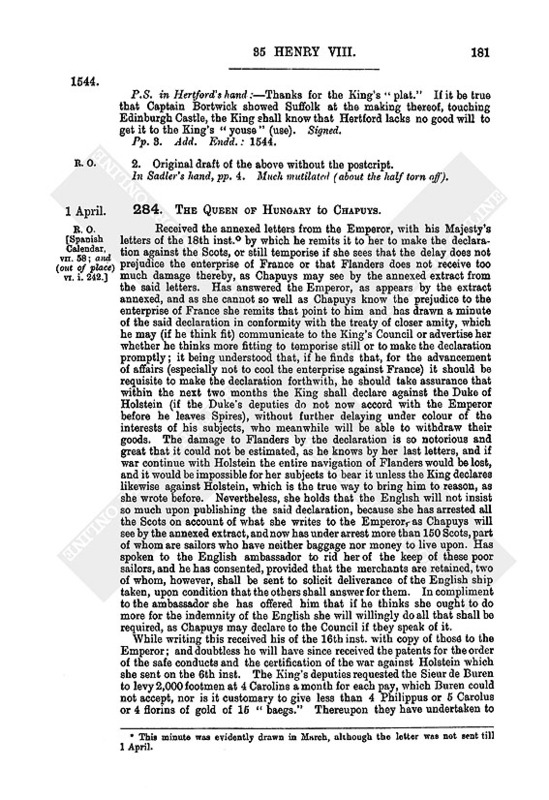 In compliment to the ambassador she has offered him that if he thinks she ought to do more for the indemnity of the English she will willingly do all that shall be required, as Chapuys may declare to the Council if they speak of it. While writing this received his of the 16th inst. with copy of those to the Emperor; and doubtless he will have since received the patents for the order of the safe conducts and the certification of the war against Holstein which she sent on the 6th inst. The King's deputies requested the Sieur de Buren to levy 2,000 footmen at 4 Carolins a month for each pay, which Buren could not accept, nor is it customary to give less than 4 Philippus or 5 Carolus or 4 florins of gold of 16 "baegs." Thereupon they have undertaken to advertise the King, without concluding. 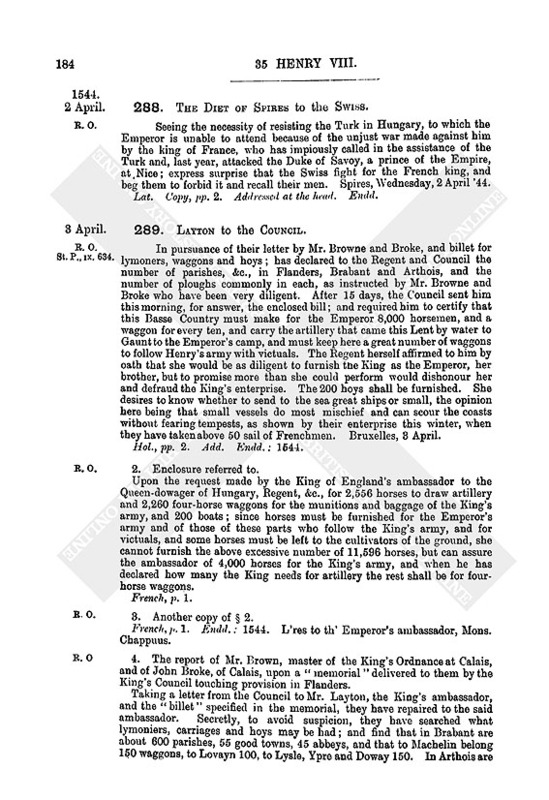 The English ambassador shows a bill of horses and wagons which the King asks to have furnished here and asks 2,556 draught horses (chevaulx lymoniers) for his artillery and 2,260 four-horse wagons for munitions and baggage; in all 11,596 horses, a number which seems excessive and not obtainable. Has nevertheless ordered a levy (description) of all the horses available so as to satisfy as far as possible, reserving sufficient for the Emperor and the 2,000 horse and the 2,000 foot which she is to furnish for the King's army. Fr. Modern transcript of the original minute at Vienna, pp. 4 Original headed: A l'ambassadeur Chapuys, du premier d'Apvril 1543, avant Pasques. 285. Hertford, Tunstall, Llandaff and Sadler to Henry VIII. This morning Hertford received letters from lord Evre with a letter of Sandy Prengille's to the captain of Norham. At 10 a.m. arrived Patie Grayme, whom Wharton sent to convey Penvan the priest and Lenoux's secretary to Angus, bringing a letter from Penvan to the King, another from Wharton and Sir Robert Bowes to Hertford, and others from Robt. Maxwell and from Dunlangrik to Wharton. Forward all these to show the dissimulation of the King's pretended friends in Scotland. Dunlangrik appears to proceed plainly. Marvel at the slipperiness of Angus, who has received more at the King's hands than all the rest. Patie Grayme, who seems a witty fellow, has written out his discourse with Angus (sent herewith). Robert Maxwell, by his letters, "somewhat roundly written," desires assurance; but, considering how he served in last journey against the Governor, and his father's subtle working to draw Angus to the Governor's devotion (as now, by means of lord Maxwell and his daughter, Angus's wife, Angus is gone to Hamilton on Monday last and will probably agree with the Governor), it is thought that he covets this assurance in order to draw his forces away from the Borders, either to join the Governor or to betray the King's pretended friends. Hertford has written to Wharton to answer that he dare not grant any assurance until the entry of lord Maxwell and lord Flemyng, for whom the King has written. Although not persuaded that they will enter, Hertford has written to Wharton to use them gently if they do. Newcastle, 2 April. P.S. in Sadler's hand.—An English surgeon who has been with Angus ever since he went to Scotland has arrived here, saying that lord Somervile is released and that the Master of Somervile lately prayed him to tell Angus that, whatsoever his father did, he would stick to Angus, whereby the surgeon gathers that lord Somervile has made some private pact with the Governor, against his promise to the King. Signed. Pp. 2. Add. Sealed. Endd: 1543. 2. Original draft of the above. In Sadler's hand, pp. 3. Much mutilated. Endd. : "Depeched ijdo Aprilis wt also thadvertysements of Patie Grayme." ii. On the back are the following memoranda. "Mens. Aprilis:—In prest to Percevall Paking the ix. of Aprell by thandes of Northrope for provicion of hoppes [xxs.]. (fn. n3) To Thomasing the same day for xv bz. whete meall at xviijd a bz., in all [xxijs. vjd.]. (fn. n3) In prest to Thomas Post the x of Aprell [xxs.] (fn. n3)." By bearer, received his letters with those to him from Robert Maxwell and Dumlanryk, and Penvan's letter to the King; all which are despatched to Court. 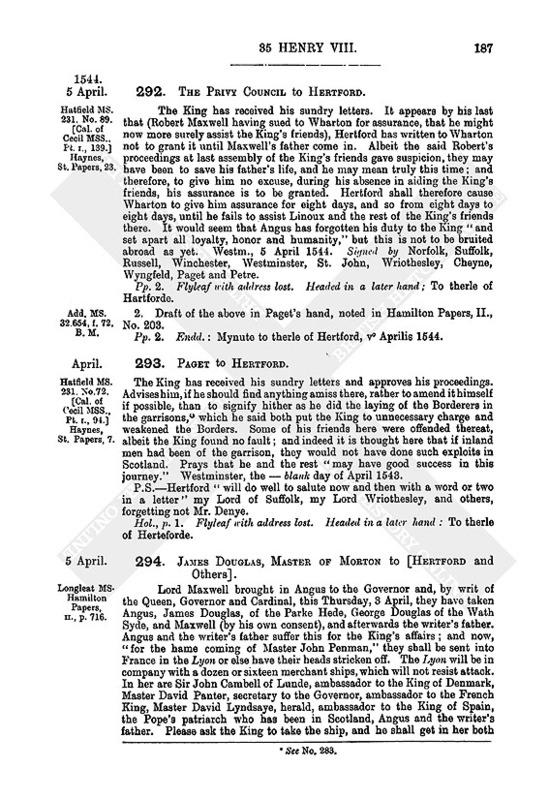 Replies to his questions, that Maxwell and Fleming are to be gently used if they enter; and that he shall answer Robert Maxwell that Hertford, being advertised of his request for assurance, says that the old assurance being broken and the King having written to his father and Fleming to enter, he (Hertford) dare not grant any new assurance until their entry; and so with good words put him off. The box with Wharton's commission and instructions, which, he writes, was opened, came not to Hertford's hands. He should endeavour to learn by whom it was opened. Draft by Sadler, pp. 2. Endd. : Depeched, 2 Aprilis. Has been, since Mr. Vaughan and he sent Mons. de Buren's answer and Vaughan departed for Spire, at Bruxelles to obtain the oath and articles the Emperor gives his foot soldiers. Describes how De Bueren made difficulty about giving it; and "I made light thereof and told him that the th [ing] was not so h [arde to com] e by, and th [at I was] sorry I had written the King's Majesty that he [had] promised it me"; and so I procured a copy of one of the clerks of the ban … which I enclose both in Dutch and French, understanding that muster masters will rather "occupy" the Dutch. De Bueren has since sent him another copy (enclosed), which is longer but to the same effect. Upon De Bueren's representation that neither the Emperor nor the King would be well served by the Almain soldiers she had appointed, the Regent has written to the Emperor. News here is not so weighty that he dare trouble the King with it. Count Guillame is sent to the Suytcers to procure them to declare with the rest of the Princes of Almain. Here has passed towards the Emperor [Do] n Alonso de los Ryos, whom the Emperor, before leaving Spain, sent to the Indies for gold; and who has brought a million and a half of gold. The treasurer of Bruxelles, with whom he lodges, says the Low Countries aid the Emperor with 300,000 fl. a month for six months beginning this April, and likewise Naples and the Emperor's other dominions "that ways" aid with 400,000 fl. a month. Many captains of High D[utch] are come to Bruxelles to offer service to the Emperor, and would serve the King if they wist he was not provided. Talk is that the Emperor repairs hither and keeps the feast of the Towzon (fn. n4) at Utreicht on 3 May; and that the Emperor and Almain princes have jointly written to the bp. of Rome to declare himself. All agree that the Emperor gives no oath to horsemen, but only takes promise of their captains. Yesternight learnt that in C[ambray] is taken and [put to a traitor's d]eth a soul[dier, one of] the Almaignes or High Dutche that was [appointed] to keep the frontiers after the breaking up [of the] camp of Landersey," who had given the French king news of these parts for 3 or 4 months and had appointed to betray the chief captain of the Dutch band to the French. Begs that, when his charge is finished, he may have other employment in the King's affairs while the King is on this side the sea. Andwarpe, 2 April. Signed: T. Chamberlain. Hol., pp. 4. Slightly mutilated. Add. Endd. : 1544. 288. The Diet of Spires to the Swiss. Seeing the necessity of resisting the Turk in Hungary, to which the Emperor is unable to attend because of the unjust war made against him by the king of France, who has impiously called in the assistance of the Turk and, last year, attacked the Duke of Savoy, a prince of the Empire, at Nice; express surprise that the Swiss fight for the French king, and beg them to forbid it and recall their men. Spires, Wednesday, 2 April '44. Lat. Copy, pp. 2. Addressed at the head. Endd. 289. Layton to the Council. In pursuance of their letter by Mr. Browne and Broke, and billet for lymoners, waggons and hoys; has declared to the Regent and Council the number of parishes, &c., in Flanders, Brabant and Arthois, and the number of ploughs commonly in each, as instructed by Mr. Browne and Broke who have been very diligent. After 15 days, the Council sent him this morning, for answer, the enclosed bill; and required him to certify that this Basse Country must make for the Emperor 8,000 horsemen, and a waggon for every ten, and carry the artillery that came this Lent by water to Gaunt to the Emperor's camp, and must keep here a great number of waggons to follow Henry's army with victuals. The Regent herself affirmed to him by oath that she would be as diligent to furnish the King as the Emperor, her brother, but to promise more than she could perform would dishonour her and defraud the King's enterprise. The 200 hoys shall be furnished. She desires to know whether to send to the sea great ships or small, the opinion here being that small vessels do most mischief and can scour the coasts without fearing tempests, as shown by their enterprise this winter, when they have taken above 50 sail of Frenchmen. Bruxelles, 3 April. Hol., pp. 2. Add. Endd. : 1544. Upon the request made by the King of England's ambassador to the Queen-dowager of Hungary, Regent, &c., for 2,556 horses to draw artillery and 2,260 four-horse waggons for the munitions and baggage of the King's army, and 200 boats; since horses must be furnished for the Emperor's army and of those of these parts who follow the King's army, and for victuals, and some horses must be left to the cultivators of the ground, she cannot furnish the above excessive number of 11,596 horses, but can assure the ambassador of 4,000 horses for the King's army, and when he has declared how many the King needs for artillery the rest shall be for four-horse waggons. 3. Another copy of § 2. French, p. 1. Endd. : 1544. L'res to th' Emperor's ambassador, Mons. Chappuus. 4. 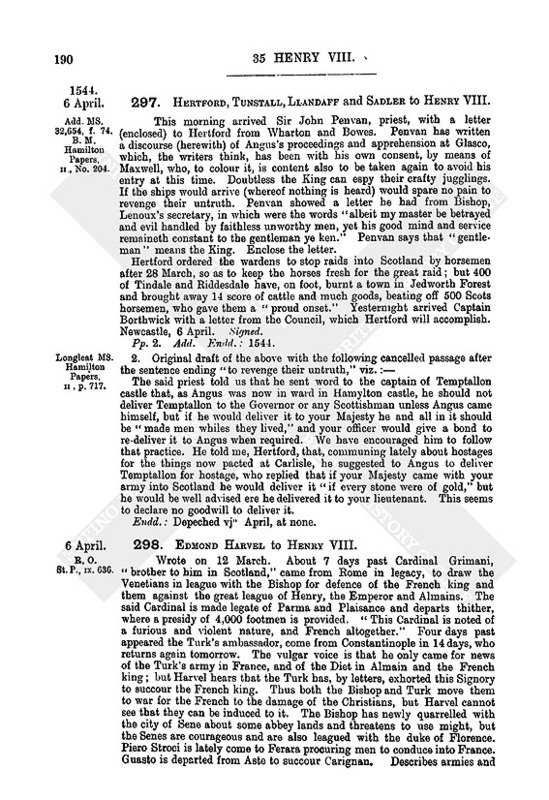 The report of Mr. Brown, master of the King's Ordnance at Calais, and of John Broke, of Calais, upon a "memorial" delivered to them by the King's Council touching provision in Flanders. Taking a letter from the Council to Mr. Layton, the King's ambassador, and the "billet" specified in the memorial, they have repaired to the said ambassador. Secretly, to avoid suspicion, they have searched what lymoniers, carriages and hoys may be had; and find that in Brabant are about 600 parishes, 55 good towns, 45 abbeys, and that to Machelin belong 150 waggons, to Lovayn 100, to Lysle, Ypre and Doway 150. In Arthois are 1,000 or 1,200 parishes, and in Flanders, with good townsand abbeys, 2,000, which may make 20, 30, 40 and some 50 ploughs each. So that all the lymoniers and waggons in the billet may easily be had. The Emperor pays 6 stivers (i.e. 9d. st.), and the Prince of Oranges 7 stivers, for every horse or mare serving in the carriage. Waggoners would rather serve in a host for 7 stivers than in the country for 9, because of getting forage without cost. Waggons have commonly 3 mares within the country, but in serving the Emperor they have 4 mares. Three mares can draw 2,500 weight and four mares 3,000 weight. Cannot learn that waggons are "made less than they were wont to be." To Amsterdam belong 200 tall ships, to Enchuysen 60 or 80, to Horne 20, to Fame Dame, Monyk Dame and Wye Dame 16. Holland alone may make 3,000 small hoys, and can easily spare the number required by the billet. 290. Hertford, Tunstall, Llandaff and Sadler to Henry VIII. Enclose letters from Wharton and Bowes to Hertford of news out of Scotland which declares "the face of a great untruth" in Angus and gives cause to mistrust all the rest who have pretended like affection. The Swepestake was yesternight gotten afloat, and this morning brought into Tynmouth haven, and will within six days, for 100l., be as well able to serve as ever. Looked for the lord Admiral and the rest of the fleet at this tide, for the wind has blown so fair these three days, but there is no word of them. Lie here with the army, spending treasure in vain, and consuming victual so fast that unless relief come shortly they must send the men far southward,—to their grief, considering the opportunity which they might have had now that the enemies are assembled at Glasco, which is almost 50 miles from Edinburgh. The ships must needs come tomorrow, the wind being so fair, and "we shall then redubbe this lack that ensueth of their long tarrying." Newcastell, 4 April, at night. Signed. Pp. 2. Add. Endd. : 1544. 2. Original draft of the above in Sadler's hand, noted in Hamilton Papers, II., p. 716. Certificate of "Oudart sieur du Bies, chevalier de l'Ordre du Roy, maréchal de France, lieutenant général pour ledit Seigneur en ses pays de Picardye et Arthois en l' absence de Monseigneur le due de Vendosmois," that by the King's command, the Sieur de St. Martin said to Mr. Halles as follows:—Having, by Marechal du Bies, learnt the conversation between the Sieur de St. Martin and Mr. Halles upon the differences of the King and the King of England, and after having advertised the King of it, the said St. Martin shall say to Halles that the King cannot understand that the amity between him and the King of England could be broken, an amity which ought to be for ever kept, and that on the King's part he desires and wishes to maintain it; and, that it may be so, the said St. Martin shall say to Halles that, if the King his master will give letters of assurance, the King will send to him ambassadors and notable personages with ample powers to treat and contract of all differences whatsoever in such manner that the King of England will have great occasion to be satisfied. Boullongne sur la Mer, 4 April 1543, avant pasques. ii. "La responce de Maistre Halle." Mons. le Marechal, having sent into England the writings received from you, I am commanded to signify that, whereas it appears that the King your master desires peace and would send ambassadors to treat it, remembering how often heretofore he has had fair words and large promises from the French king with no good effect (who even at present is encouraging and soliciting the Scots to be his enemies and break their bond to him), the King has cause to think that the "overtures proposed by the said St. Martin unto me by your instructions and appointment" are but practices. 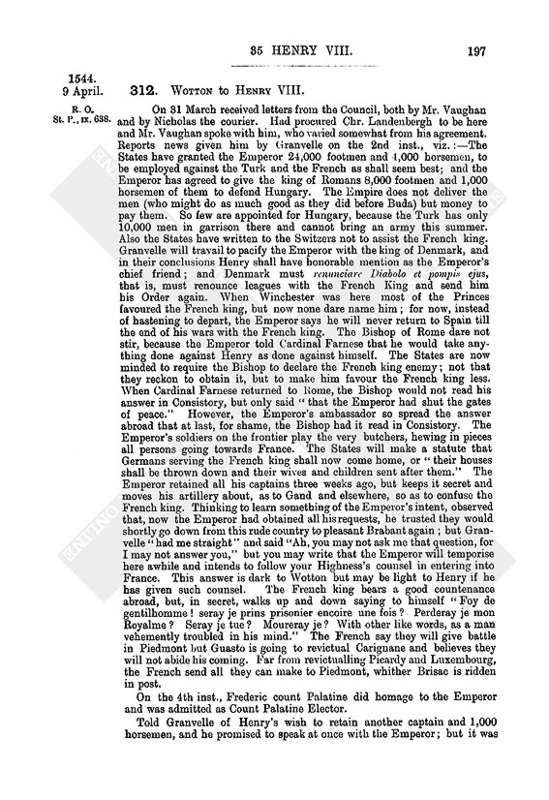 If the French king means indeed what has been written in his behalf by Du Bies, let him first abandon the Scots, and desist from aiding them against the King; and he must first let the King know what things he means to offer for peace and to treat upon, so that the King may have some occasion to think that he "worketh bonâ fide and would be glad to have that indeed which by words and writings he professeth to desire." If these offers show likelihood that he will come to a reasonable satisfaction of the matters between him and the King and between him and the Emperor, there may be further communication and an honorable composition. 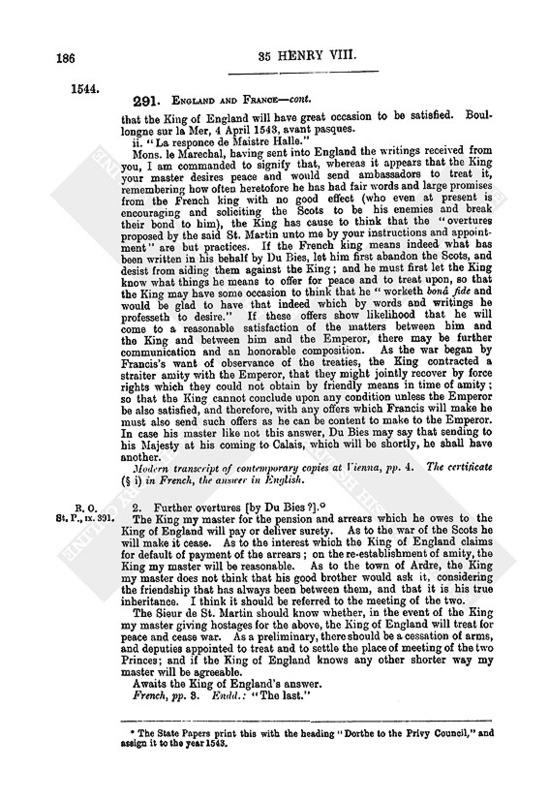 As the war began by Francis's want of observance of the treaties, the King contracted a straiter amity with the Emperor, that they might jointly recover by force rights which they could not obtain by friendly means in time of amity; so that the King cannot conclude upon any condition unless the Emperor be also satisfied, and therefore, with any offers which Francis will make he must also send such offers as he can be content to make to the Emperor. In case his master like not this answer, Du Bies may say that sending to his Majesty at his coming to Calais, which will be shortly, he shall have another. Modern transcript of contemporary copies at Vienna, pp. 4. The certificate (§ i) in French, the answer in English. The King my master for the pension and arrears which he owes to the King of England will pay or deliver surety. As to the war of the Scots he will make it cease. As to the interest which the King of England claims for default of payment of the arrears; on the re-establishment of amity, the King my master will be reasonable. As to the town of Ardre, the King my master does not think that his good brother would ask it, considering the friendship that has always been between them, and that it is his true inheritance. I think it should be referred to the meeting of the two. The Sieur de St. Martin should know whether, in the event of the King my master giving hostages for the above, the King of England will treat for peace and cease war. As a preliminary, there should be a cessation of arms, and deputies appointed to treat and to settle the place of meeting of the two Princes; and if the King of England knows any other shorter way my master will be agreeable. Awaits the King of England's answer. French, pp. 3. Endd. : "The last." 292. The Privy Council to Hertford. The King has received his sundry letters. It appears by his last that (Robert Maxwell having sued to Wharton for assurance, that he might now more surely assist the King's friends), Hertford has written to Wharton not to grant it until Maxwell's father come in. Albeit the said Robert's proceedings at last assembly of the King's friends gave suspicion, they may have been to save his father's life, and he may mean truly this time; and therefore, to give him no excuse, during his absence in aiding the King's friends, his assurance is to be granted. 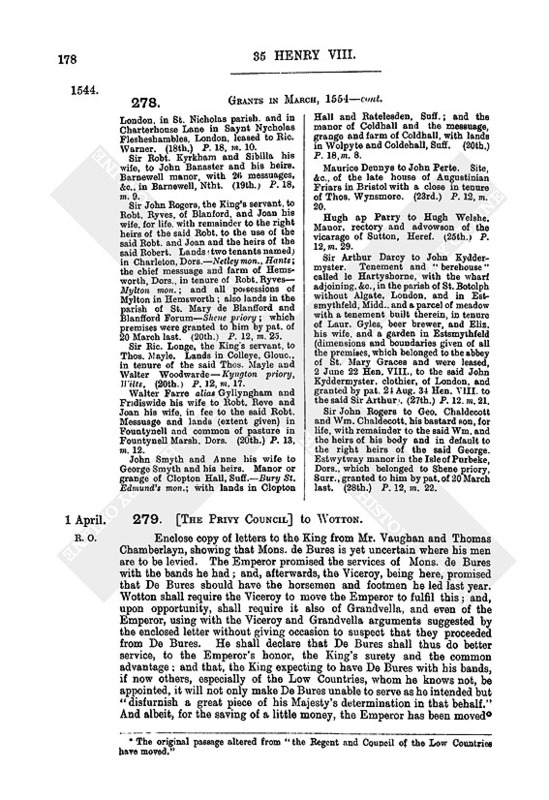 Hertford shall therefore cause Wharton to give him assurance for eight days, and so from eight days to eight days, until he fails to assist Linoux and the rest of the King's friends there. It would seem that Angus has forgotten his duty to the King "and set apart all loyalty, honor and humanity," but this is not to be bruited abroad as yet. Westm., 5 April 1544. Signed by Norfolk, Suffolk, Russell, Winchester, Westminster, St. John, Wriothesley, Cheyne, Wyngfeld, Paget and Petre. Pp. 2. Flyleaf with address lost. Headed in a later hand; To therle of Hartforde. 2. Draft of the above in Paget's hand, noted in Hamilton Papers, II., No. 203. Pp. 2. Endd. : Mynute to therle of Hertford, v0 Aprilis 1544. Pt. i., 94.]Haynes,St. Papers, 7. The King has received his sundry letters and approves his proceedings. Advises him, if he should find anything amiss there, rather to amend it himself if possible, than to signify hither as he did the laying of the Borderers in the garrisons, (fn. n6) which he said both put the King to unnecessary charge and weakened the Borders. Some of his friends here were offended thereat, albeit the King found no fault; and indeed it is thought here that if inland men had been of the garrison, they would not have done such exploits in Scotland. Prays that he and the rest "may have good success in this journey." Westminster, the— blank day of April 1543. P.S.—Hertford "will do well to salute now and then with a word or two in a letter" my Lord of Suffolk, my Lord Wriothesley, and others, forgetting not Mr. Denye. Hol., p. 1. Flyleaf with address lost. Headed in a later hand: To therle of Herteforde. 294. James Douglas, Master of Morton to [Hertford and Others]. 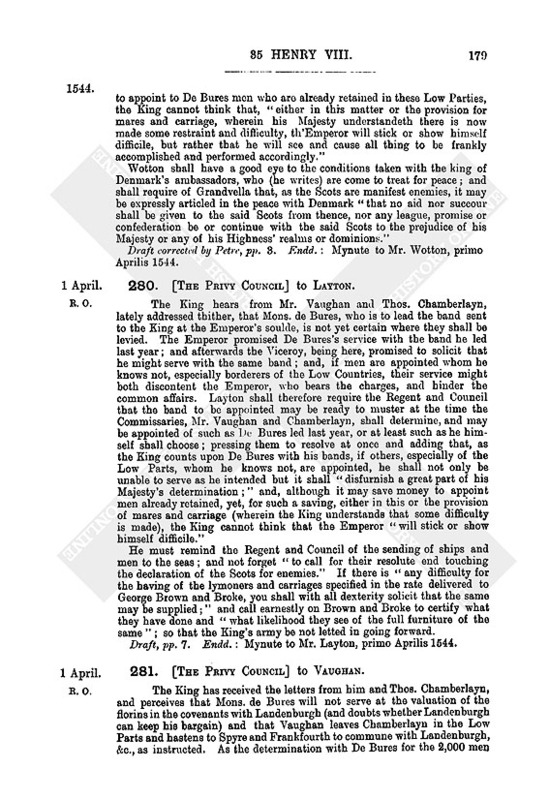 Lord Maxwell brought in Angus to the Governor and, by writ of the Queen, Governor and Cardinal, this Thursday, 3 April, they have taken Angus, James Douglas, of the Parke Hede, George Douglas of the Wath Syde, and Maxwell (by his own consent), and afterwards the writer's father. Angus and the writer's father suffer this for the King's affairs; and now, "for the hame coming of Master John Penman," they shall be sent into France in the Lyon or else have their heads stricken off. The Lyon will be in company with a dozen or sixteen merchant ships, which will not resist attack. In her are Sir John Cambell of Lunde, ambassador to the King of Denmark, Master David Panter, secretary to the Governor, ambassador to the French King, Master David Lyndsaye, herald, ambassador to the King of Spain, the Pope's patriarch who has been in Scotland, Angus and the writer's father. Please ask the King to take the ship, and he shall get in her both foes and friends; and to haste his army to Scotland for the relief of his other friends, who will then take part with him, viz., Lenoux, Glencarne Cassellis the sheriff of Ayre, Drumlaneryk and the writer. Is sure of the houses of Temptallon and Daykeyth, but wishes the King's help if besieged, as he expects soon to be. The Governor is now besieging Glascoo, which Lenoux keeps. The King will never get so good a time again, for had his army been in now they durst not have handled Angus and his friends so. Prays their lordships to "gar haste the post" to the King. The captain of Berwick knows when to give the answer to Alex. Lader in the Calf Mills. Dayketh, 5 April. Copy. Address copied: To the Kynges Grace Majeste moste nobyll counsaile in the Northt. 295. D'Annebaut to the Queen of Hungary. The King having made him Admiral of France, he finds that hitherto the admirals of France and of Flanders have taken money for safe-conducts for the fishery, which seems an unreasonable exaction upon the people, considering the greatness of their masters; and if she, for the relief of the people, will grant a fishing truce (tresre pescheresse) permitting them to fish without paying, he thinks that the King will not refuse a work so good and praiseworthy. Bouches, 5 April. French, p. 1. Copy describing the original as subscribed "v're treshumble et tresobeissant s'viteur Hannebault." Endd. : A copy of a letter from Mons. de Hannibault to the Regent of Flanders, 5 Aprilis 1544. 296. The Duke of Nagera's Visit to England. Narrative of the Emperor's journey to Italy, Germany and Flanders in the present year, 1543, containing an account of the Emperor's conquest of Gueldres from the Duke of Cleves and his war with France, written by Pedro de Gante, secretary of the duke of Nagera, who was present. After (fn. n7) serving the Emperor in the above series of victories, the duke of Nagera requested leave to return home, as also did the duke of Albuquerque and the abp. of Santiago. The Duke left Brussels on Saturday (fn. n8) 29 Dec.  for Antwerp, where he stopped until Friday, 18 Jan., and then set out for Spain accompanied by Don Rodriquez de Mendoça, brother of the Marquess of Cenete, Tello de Guzman a gentleman of Toledo, Don Philip Cerbellon and other gentlemen. The Duke remained at Bruges until Tuesday, 29 Jan. and reached Calais on Saturday following. On the Monday he embarked for Dover, there being no way thither by land because England is an island. After sailing all day it was night before they reached Dover. On Friday, 8 Feb., the Duke went to Canterbury, on Saturday to Rochester, and on Monday, 11 Feb., to London, to dine with Stacio Capucho, a native of Savoy, the Emperor's ambassador in that Court. The King, hearing of the Duke's arrival, went next morning a league away to view some ships that were building, and so gain time to assemble noblemen and gentlemen that he might show himself to the Duke with greater authority; sending meanwhile the earl of Surrey with compliments. On Sunday, 17 Feb., a brother of the Queen and the earl of Surrey dined with the Duke, who, after dinner, accompanied by them and some Spanish gentlemen resident in London, proceeded to the King's palace by water. They passed through three halls hung with tapestry, in the second of which stood on either side the King's bodyguard dressed in red and holding halberds, and in the third were many nobles, knights and gentlemen, and a chair of state to which all present paid reverence. After waiting a quarter of an hour the Duke was called into the King's chamber with only Don Rodrigo de Mendoça and Tello de Guzman. The rest were not permitted even to see the King. Attributes this to mistrust, as no prince, Christian or infidel, has ever ordered so many executions for opposing his opinions (described). 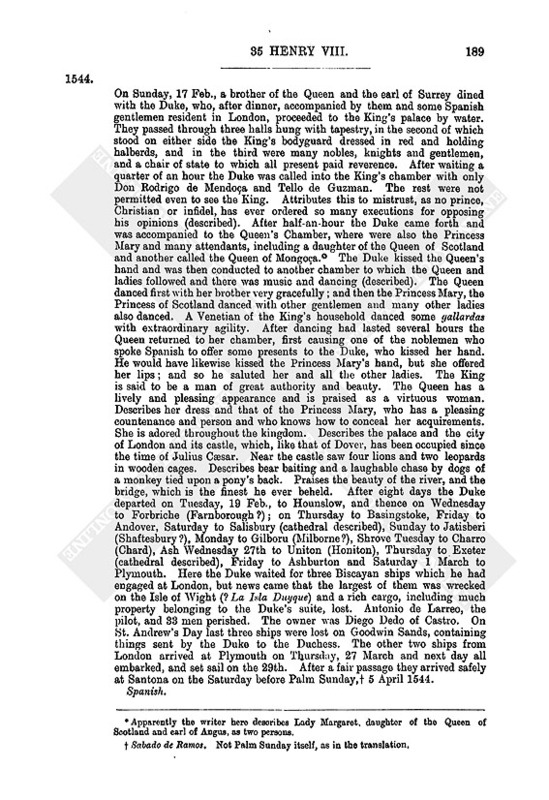 After half-an-hour the Duke came forth and was accompanied to the Queen's Chamber, where were also the Princess Mary and many attendants, including a daughter of the Queen of Scotland and another called the Queen of Mongoça. (fn. n9) The Duke kissed the Queen's hand and was then conducted to another chamber to which the Queen and ladies followed and there was music and dancing (described). The Queen danced first with her brother very gracefully; and then the Princess Mary, the Princess of Scotland danced with other gentlemen and many other ladies also danced. A Venetian of the King's household danced some gallardas with extraordinary agility. After dancing had lasted several hours the Queen returned to her chamber, first causing one of the noblemen who spoke Spanish to offer some presents to the Duke, who kissed her hand. He would have likewise kissed the Princess Mary's hand, but she offered her lips; and so he saluted her and all the other ladies. The King is said to be a man of great authority and beauty. The Queen has a lively and pleasing appearance and is praised as a virtuous woman. Describes her dress and that of the Princess Mary, who has a pleasing countenance and person and who knows how to conceal her acquirements. She is adored throughout the kingdom. Describes the palace and the city of London and its castle, which, like that of Dover, has been occupied since the time of Julius Caesar. Near the castle saw four lions and two leopards in wooden cages. Describes bear baiting and a laughable chase by dogs of a monkey tied upon a pony's back. Praises the beauty of the river, and the bridge, which is the finest he ever beheld. After eight days the Duke departed on Tuesday, 19 Feb., to Hounslow, and thence on Wednesday to Forbriche (Farnborough? ); on Thursday to Basingstoke, Friday to Andover, Saturday to Salisbury (cathedral described), Sunday to Jatisberi (Shaftesbury? ), Monday to Gilboru (Milborne? ), Shrove Tuesday to Charro (Chard), Ash Wednesday 27th to Uniton (Honiton), Thursday to Exeter (cathedral described), Friday to Ashburton and Saturday 1 March to Plymouth. Here the Duke waited for three Biscayan ships which he had engaged at London, but news came that the largest of them was wrecked on the Isle of Wight (? La Isla Duyque) and a rich cargo, including much property belonging to the Duke's suite, lost. Antonio de Larreo, the pilot, and 33 men perished. The owner was Diego Dedo of Castro. On St. Andrew's Day last three ships were lost on Goodwin Sands, containing things sent by the Duke to the Duchess. The other two ships from London arrived at Plymouth on Thursday, 27 March and next day all embarked, and set sail on the 29th. After a fair passage they arrived safely at Santona on the Saturday before Palm Sunday, (fn. n10) 5 April 1544. 297. Hertford, Tunstall, Llandaff and Sadler to Henry VIII. This morning arrived Sir John Pen van, priest, with a letter (enclosed) to Hertford from Wharton and Bowes. 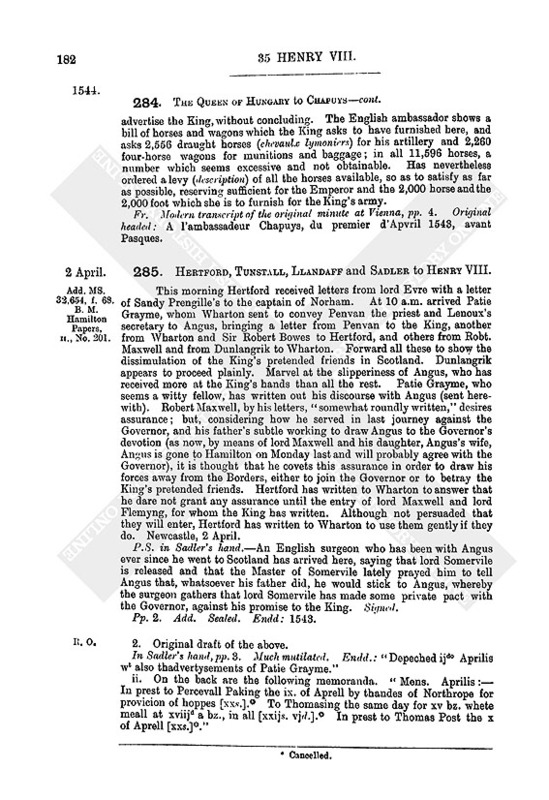 Pen van has written a discourse (herewith) of Angus's proceedings and apprehension at Glasco, which, the writers think, has been with his own consent, by means of Maxwell, who, to colour it, is content also to be taken again to avoid his entry at this time. Doubtless the King can espy their crafty jugglings. If the ships would arrive (whereof nothing is heard) would spare no pain to revenge their untruth. Penvan showed a letter he had from Bishop, Lenoux's secretary, in which were the words "albeit my master be betrayed and evil handled by faithless unworthy men, yet his good mind and service remaineth constant to the gentleman ye ken." Penvan says that "gentleman" means the King. Enclose the letter. Hertford ordered the wardens to stop raids into Scotland by horsemen after 28 March, so as to keep the horses fresh for the great raid; but 400 of Tindale and Riddesdale have, on foot, burnt a town in Jedworth Forest and brought away 14 score of cattle and much goods, beating off 500 Scots horsemen, who gave them a "proud onset." Yesternight arrived Captain Borthwick with a letter from the Council, which Hertford will accomplish. Newcastle, 6 April. Signed. The said priest told us that he sent word to the captain of Temptallon castle that, as Angus was now in ward in Hamylton castle, he should not deliver Temptallon to the Governor or any Scottishman unless Angus came himself, but if he would deliver it to your Majesty he and all in it should be "made men whiles they lived," and your officer would give a bond to re-deliver it to Angus when required. We have encouraged him to follow that practice. He told me, Hertford, that, communing lately about hostages for the things now pacted at Carlisle, he suggested to Angus to deliver Temptallon for hostage, who replied that if your Majesty came with your army into Scotland he would deliver it "if every stone were of gold," but he would be well advised ere he delivered it to your lieutenant. This seems to declare no goodwill to deliver it. Endd. : Depeched vj0 April, at none. 298. Edmond Harvel to Henry VIII. Wrote on 12 March. About 7 days past Cardinal Grimani, "brother to him in Scotland," came from Rome in legacy, to draw the Venetians in league with the Bishop for defence of the French king and them against the great league of Henry, the Emperor and Almains. The said Cardinal is made legate of Parma and Plaisance and departs thither, where a presidy of 4,000 footmen is provided. "This Cardinal is noted of a furious and violent nature, and French altogether." Four days past appeared the Turk's ambassador, come from Constantinople in 14 days, who returns again tomorrow. The vulgar voice is that he only came for news of the Turk's army in France, and of the Diet in Almain and the French king; but Harvel hears that the Turk has, by letters, exhorted this Signory to succour the French king. Thus both the Bishop and Turk move them to war for the French to the damage of the Christians, but Harvel cannot see that they can be induced to it. The Bishop has newly quarrelled with the city of Sene about some abbey lands and threatens to use might, but the Senes are courageous and are also leagued with the duke of Florence. Piero Stroci is lately come to Ferara procuring men to conduce into France. Guasto is departed from Aste to succour Carignan. Describes armies and proceedings there. Barbarossa has gone from Tolon to some islands about Marseilles to put his galleys ready. There is no rumor of any Turkish expedition this year; but that Lutefi Bassa, who married the Turk's sister and hates Barbarossa, is restored to favour and Barbarossa likely to be revoked. The resolution of the Almain Diet against the French king and Turk was very grievous and formidable to the Bishop and the French faction. Venice, 6 April 1544. 299. Hertford, Tunstall, Llandaff and Sadler to Henry VIII. Yesternight arrived Edw. 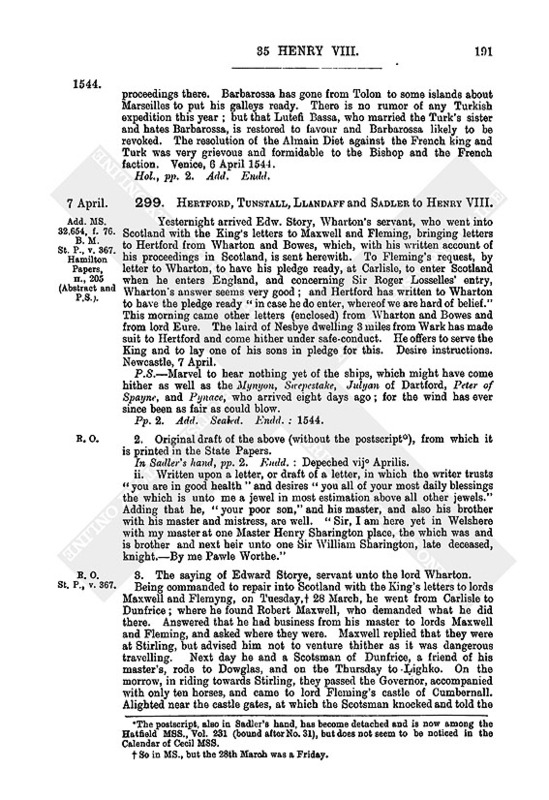 Story, Wharton's servant, who went into Scotland with the King's letters to Maxwell and Fleming, bringing letters to Hertford from Wharton and Bowes, which, with his written account of his proceedings in Scotland, is sent herewith. To Fleming's request, by letter to Wharton, to have his pledge ready, at Carlisle, to enter Scotland when he enters England, and concerning Sir Roger Losselles' entry, Wharton's answer seems very good; and Hertford has written to Wharton to have the pledge ready "in case he do enter, whereof we are hard of belief." This morning came other letters (enclosed) from Wharton and Bowes and from lord Eure. The laird of Nesbye dwelling 3 miles from Wark has made suit to Hertford and come hither under safe-conduct. He offers to serve the King and to lay one of his sons in pledge for this. Desire instructions. Newcastle, 7 April. P.S.—Marvel to hear nothing yet of the ships, which might have come hither as well as the Mynyon, Swepestake, Julyan of Dartford, Peter of Spayne, and Pynace, who arrived eight days ago; for the wind has ever since been as fair as could blow. Pp. 2. Add. Sealed. Endd. : 1544. 2. Original draft of the above (without the postscript (fn. n11) ), from which it is printed in the State Papers. In Sadler's hand, pp. 2. Endd. : Depeched vijo Aprilis. ii. Written upon a letter, or draft of a letter, in which the writer trusts "you are in good health" and desires "you all of your most daily blessings the which is unto me a jewel in most estimation above all other jewels." Adding that he, "your poor son," and his master, and also his brother with his master and mistress, are well. "Sir, I am here yet in Welshere with my master at one Master Henry Sharington place, the which was and is brother and next heir unto one Sir William Sharington, late deceased, knight.—By me Pawle Worthe." 3. The saying of Edward Storye, servant unto the lord Wharton. Being commanded to repair into Scotland with the King's letters to lords Maxwell and Flemyng, on Tuesday, (fn. n12) 28 March, he went from Carlisle to Dunfrice; where he found Robert Maxwell, who demanded what he did there. Answered that he had business from his master to lords Maxwell and Fleming, and asked where they were. Maxwell replied that they were at Stirling, but advised him not to venture thither as it was dangerous travelling. Next day he and a Scotsman of Dunfrice, a friend of his master's, rode to Dowglas, and on the Thursday to Lighko. On the morrow, in riding towards Stirling, they passed the Governor, accompanied with only ten horses, and came to lord Fleming's castle of Cumbernall. Alighted near the castle gates, at which the Scotsman knocked and told the porter that a servant of the Master of Maxwell's came with a message. Thus he got access to Flemyng and said that a servant of lord Wharton's was at the gates with letters for him. He was astonished, but sent for Story, who thereupon delivered him the King's letters both to him and Maxwell. He kissed the letters and took off his bonnet, saying: "Jesus benedicite! how thou durst come hither into this country? but I am glad that thou art come to my house, and since thou art here the highest stone shall be the lowest ere thou shalt take any skaith." After reading the letter Flemyng called his clerk and made another letter, enclosing it, to the Governor and Council; and told Story that it was said that the King's council had "made a contract" for their ransoms, and therefore he must let the Governor know what he received from the King, but he would enter according to his promise unless fettered. Before day a pursuivant brought letters to Flemyng, to send the bringers of the King's letters to the Governor and Council on pain of treason. Flemyng thereupon rode to the Governor and Council, and returned on the morrow, saying that they were displeased; but, although two more letters came that day for like purpose, he still refused to deliver them (Story and his companion) to the pursuivant, and again rode to the Council being with the army at Glasco. On the morrow he sent word that he had got their pardons, and advised them to get home secretly, sending 6 cr. st. for them. So they stole home in the night. On Monday last Anguishe with a few horses came to Hamylton to the Governor and Maxwell, and on the morrow returned to Dowglas and fetched his men to Hamylton. The three, with divers others, went the next day to Glasco and took the town and besieged the castle, which was fortified by Lennoux's servants; knows not what followed, but no man was in such favour with the Governor as Anguishe, and, yet, that night, he and Maxwell were both brought back to Hamylton and put in ward, so that men supposed that it was done with their own consents. Draft in Sadler's hand, pp. 5. 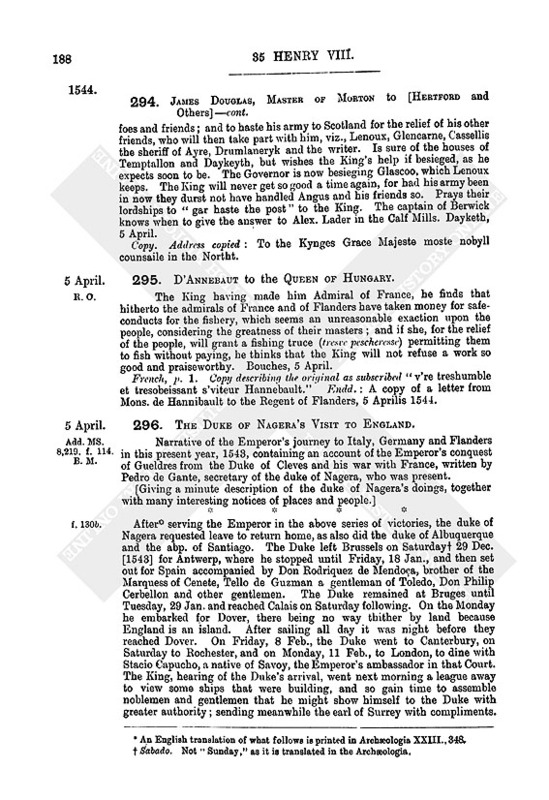 Headed: 6 April 35 Henry VIII. Accounts of Anthony Cave, merchant of the Staple for the years 1534-1537, with three of his business letters to John Johnson attached, two of which are in his own hand. The first of these two is of the year 1548; the second is dated Calais, 7 April 1544. 301. The Count of Buren to Henry VIII. 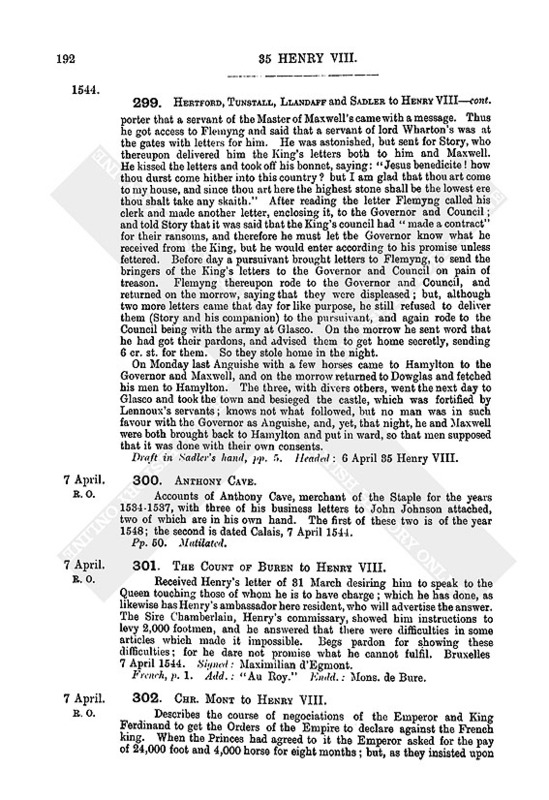 Received Henry's letter of 31 March desiring him to speak to the Queen touching those of whom he is to have charge; which he has done, as likewise has Henry's ambassador here resident, who will advertise the answer. The Sire Chamberlain, Henry's commissary, showed him instructions to levy 2,000 footmen, and he answered that there were difficulties in some articles which made it impossible. Begs pardon for showing these difficulties; for he dare not promise what he cannot fulfil. Bruxelles 7 April 1544. Signed: Maximilian d'Egmont. French, p. 1. Add. : "Au Roy." Endd. : Mons. de Bure. 302. Chr. Mont to Henry VIII. Describes the course of negociations of the Emperor and King Ferdinand to get the Orders of the Empire to declare against the French king. When the Princes had agreed to it the Emperor asked for the pay of 24,000 foot and 4,000 horse for eight months; but, as they insisted upon the danger from the Turk in Hungary if all their forces were turned against France, he altered his request to 8,000 foot and 1,000 horse to defend Hungary, and the rest to join his army against France. The Emperor urges them to conclude this article as the season demands, and then proceed to the other articles of the first proposition, and give peace and judgment to the Empire. The Imperial cities have not yet consented to the war, for they wish things to be done in order and to proceed with the French king by counsels rather than arms; in which opinion the Princes were until the Emperor persuaded them that the French king would not regard their letters, since he did not deign to answer the letters sent him from the Diet of Spires in the year '42. The cities also reflect that they have much goods in France and the French very little in Germany; but the Princes are the majority. Encloses the recent answer of the Roman bishop to the Catholic states; also the speech of the bishop of Vesprenensis and other nobles who have come in embassy from the states of Hungary. Two days ago the Emperor and all the Princes sent a letter to the Swiss warning them not to aid the French king (as confederate with the Turk), but rather join the other members of the Empire against the Turk. It is thought that this will have little weight with some, for it is said that the cantons which adhere to the Roman bishop have sent 12,000 [men] to the French king. The Elector of Brandenburg arrived four days ago; so that now all the Electors are present, in whose presence the Emperor granted in fee (in feudum) to Frederic Palatine the Electorate of the Palatinate, on the 4th April. Spires, 7 April 1544. 303. The Privy Council to Hertford. Having considered his letters and the advertisements he sent from Sir John Penven and others, the King would have all policies used, by money, promises or otherwise, to get Tyntallon into his hands when his navy passes that way. As to Angus the King doubts not but that Hertford will consider his manifest untruth, and, if any come in his name to Carlisle to commune with his Majesty's Commissioners, that they will be used as to his honest dealing appertains. Westm., 8 April 1544. Signed by Russell, Wriothesley, Browne, Paget and Petre. Add. Endd. : Received x0 April, at night. 304. Wriothesley to Chr. Mont. The King is pleased with his diligence and dexterity and has determined "that, upon certain alterations which shalbe made here shortly, ye shalbe looked upon and considered with a prebend and otherwise in process of time." Promises remembrance and refers the rest to the King's letters. London, 8 April. Signed. P. 1. Add. 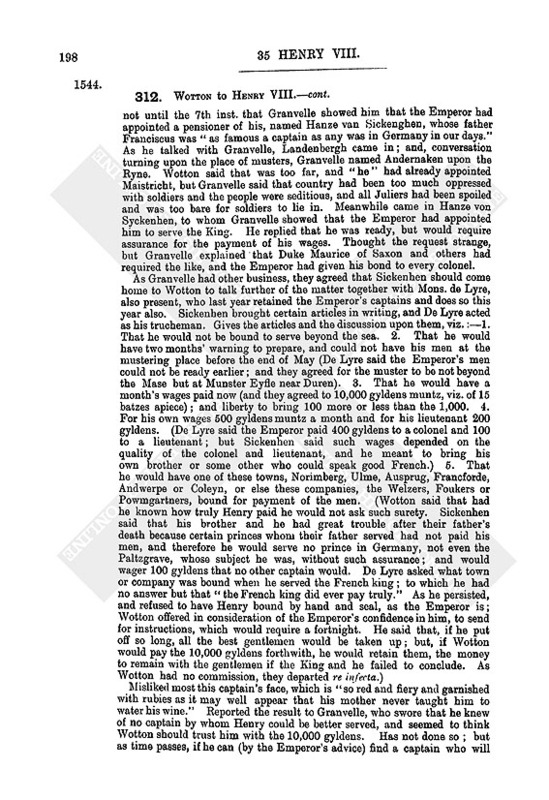 : "To myn assured loving frende Mr. Christopher Mont, the King's Majesties agent in Germanye." Sealed. Endd. : My lord Chancellor to Chr. Mount. Also endd. in Mont's hand: Missa Haganoa anno 4°. 305. Hertford, Tunstall, Llandaff and Sadler to Henry VIII. This morning arrived letters from the Master of Morton, Sir George Douglas's son, brought from Berwick by the ordinary post; and also news of Scotland from Sandy Pringle and Gilbert Swynehoo. To encourage the Master of Morton in the determination which his letter declares, Hertford has answered as in the copy herewith. Newcastell, 8 April. Signed. P.I. Add. Sealed. Endd. : 1544. In Sadler's hand, p. 1.
ii. On the back is the following entry in the same hand as No. 299 (2 ii. ):—"Memorandum this bocke parteyneth unto one Maister Richarde Robartes. If he hym loste and yow hym fynde y pray you take the labour and p."
Pt. i., 140.]Haynes'St. Papers, 24. Perceives by his letter the "hard case and danger" in which Angus and his father and the rest of the King's friends stand through the false dealing of lord Maxwell, with his own determination to keep Dalkeith and Temptallon castles to the King's pleasure. Is sorry for the trouble of Angus and his father, but glad to see him so well determined to revenge it. 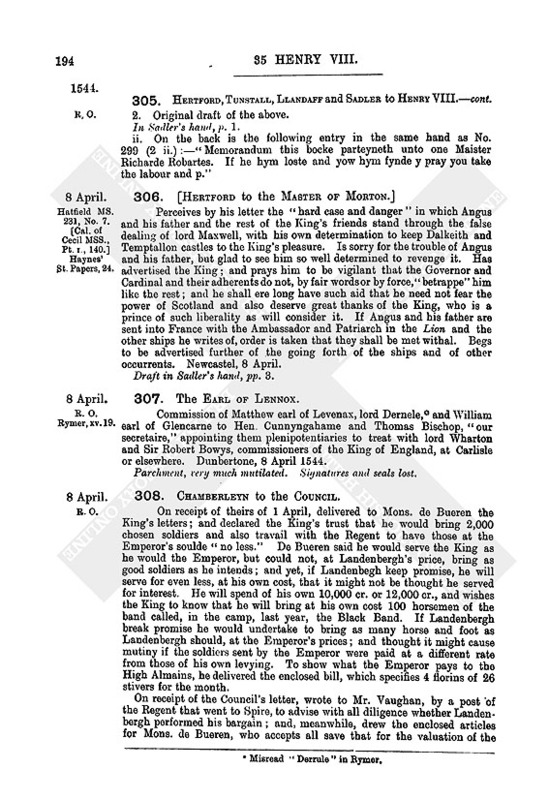 Has advertised the King; and prays him to be vigilant that the Governor and Cardinal and their adherents do not, by fair words or by force, "betrappe" him like the rest; and he shall ere long have such aid that he need not fear the power of Scotland and also deserve great thanks of the King, who is a prince of such liberality as will consider it. If Angus and his father are sent into France with the Ambassador and Patriarch in the Lion and the other ships he writes of, order is taken that they shall be met withal. Begs to be advertised further of the going forth of the ships and of other occurrents. Newcastel, 8 April. Draft in Sadler's hand, pp. 3. 307. The Earl of Lennox. Commission of Matthew earl of Levenax, lord Dernele, (fn. n13) and William earl of Glencarne to Hen. Cunnyngahame and Thomas Bischop, "our secretaire," appointing them plenipotentiaries to treat with lord Wharton and Sir Robert Bowys, commissioners of the King of England, at Carlisle or elsewhere. Dunbertone, 8 April 1544. Parchment, very much mutilated. Signatures and seals lost. 308. Chamberleyn to the Council. On receipt of theirs of 1 April, delivered to Mons. de Bueren the King's letters; and declared the King's trust that he would bring 2,000 chosen soldiers and also travail with the Regent to have those at the Emperor's soulde "no less." De Bueren said he would serve the King as he would the Emperor, but could not, at Landenbergh's price, bring as good soldiers as he intends; and yet, if Landenbegh keep promise, he will serve for even less, at his own cost, that it might not be thought he served for interest. He will spend of his own 10,000 cr. or 12,000 cr., and wishes the King to know that he will bring at his own cost 100 horsemen of the band called, in the camp, last year, the Black Band. If Landenbergh break promise he would undertake to bring as many horse and foot as Landenbergh should, at the Emperor's prices; and thought it might cause mutiny if the soldiers sent by the Emperor were paid at a different rate from those of his own levying. To show what the Emperor pays to the High Almains, he delivered the enclosed bill, which specifies 4 florins of 26 stivers for the month. On receipt of the Council's letter, wrote to Mr. Vaughan, by a post of the Regent that went to Spire, to advise with all diligence whether Landenbergh performed his bargain; and, meanwhile, drew the enclosed articles for Mons. de Bueren, who accepts all save that for the valuation of the florin, and desires the King's answer and letters of retinue, such as the Emperor gives, which should declare that the King accepts him into his "service and retinue at this time" with 2,000 good soldiers at a price specified. On receipt of these letters of retinue, he will sign the articles, receive his conduct money and put his soldiers ready to muster at Buldwike about 14 May. He marvelled that he had no answer whether the King would accept his offer of 400 or 500 horsemen and 2,000 footmen more; but Chamberleyn answered that the King had now sent to know how Mr. Vaughan sped with Landenbergh, and, upon that knowledge, would instruct him further. De Bueren said the Regent had resolved with him that he should have the horsemen she had levied in the Low Countries, and for the footmen she had written to the Emperor. He desires to have a trucheman who can speak both English and French; and has promised to travail with the Regent that her bands may be ready to muster with his at Buldwike. As the articles show, conduct money and the 100 fl. upon every ensign is agreed for in florins of 20 stivers, which is less than Landenbergh has. De Bueren delivered the enclosed bill of head officers necessary, which are extraordinary pays besides the pays and double pays of the ensigns, which by custom must be allowed upon the whole band, great or small. Eight days past, Mons. du Reux and a band of his men, at daybreak, set ladders to the walls of Turwane and were going up when they were discovered, "and so recoiled without loss." The Emperor's galleys in Spain have taken a foist coming from Alger to Barbarossa with news that the King of Cusco had besieged Alger and was like to win it. The duke of Cameryne, who went lately to the bishop of Rome, is returning to the Emperor—a sign that the Bishop will declare himself with the Emperor. These news may be used with the King as seems good, for they are not from "any place of credit, but of the common bruit." Bruxelles, 8 April 1544. Signed: T. Chamberlein. P.S.—Mons. de Buryn sends, herewith, a letter to the King. 2. Articles and covenants passed between the count of Bueren and Thos. Chamberlin, commissary of the King of England, by which the Count has promised to bring the King 2,000 footmen. Seventeen numbered articles regulating the muster, pay and service of the men. Each ensign is to contain 400 men, of whom 50 or 60 shall be harquebusiers, 30 halberdiers and the rest pikemen. The muster shall be near Boisleduc on 14 May, and for conduct money thither each footman shall have 1 fl. worth 20 pattars of Brabant and each ensign 100 fl. Their pay afterwards shall be 4 fl. the month, if Landenberch serves at that price; but, if not, it shall be 4 Philips of 25 pattars of Brabant, or such pay as the Emperor's men under the count shall have. Rules for double pays and pays for battle or assault. A month contains 30 days; and florins of 20 stivers of Brabant are to be worth 2s. 6d. st. The men shall serve for 6 months, against all save the Emperor and Holy Empire. Rules for obedience and discipline in the field. Half a month's pay to be allowed for return home. Current money (named) of England and France to be taken in lieu of florins, pattars and stivers. Made at Brussels, 8 April 1544. French, copy, pp. 4. Endd. : "Thomas Chamberlayn to the Counsail, viijo Aprilis 1544." Queen Katharine's appointment of Sir Richard Maners to be [keeper] of her lordship and manor of Fodrynghaye. Westm., 9 April 35 Hen. VIII. Two copies, each p. 1. Very mutilated. 310. Hertford and Others to Henry VIII. Enclose letters which arrived this morning from lord Wharton to Hertford, with others from the Master of Maxwell and Drumlaneryke to Wharton. Where Drumlaneryke desires to know the cause of the stay of the King's army, and wishes it might come shortly to their relief in Scotland; Hertford has, for his comfort, required Wharton to write advising him and the rest of the King's friends to keep together out of danger of their enemies, for, if they show themselves of such sort as they promised, they shall shortly have aid. On receipt of the Council's letters to grant assurance to Robert Maxwell from eight days to eight days, Hertford wrote to Wharton to do so if Maxwell eftsoons made suit for it. Where it appears by Wharton and Bowes's letters that Bowes, "perceiving no such matter to succeed [or] follow as he was sent for," intends to repair hither; the writers will stay him here till they know the King's further pleasure, to the intent that, if Lenoux send commissioners to Carlisle, Bowes may the sooner repair thither. Draft in Sadler's hand, pp. 3. Endd. : "Depeched ix0 April." 311. Layton to the Council. Upon their letters of 1 April has earnestly communed with the Regent and Council for the "alleviacyon" of the horse and foot whom De Bures shall have in the Emperor's soulde. The Regent affirms that she has written to the Emperor that the footmen may be levied of Basse Almaignes (De Bures being a Basse Almaigne), that she has appointed the 2,000 horsemen out of the best of these parts, with whom De Bures is right well content, and that the band of 4,000 shall be an elect band and "much surmount" the hasty levy of 2,000 foot and 300 horse which De Bures led last year. All the Scots were put in prison, so that the sustenance of the poorest sort cost the Regent 40 gylders a day; for "the merchants found themselves, and yet do, and remain in prison." The rabblement were then set at large, to avoid expense, and were to have an old boat given them, to go to their own country, but, by night, they took away a ship of Anderson's full freight. The factors came to Gaunt to declare their misfortune; and Layton went to the Regent, who put the rest of the rabble back in prison, examined some by torture and carried them to the Pyne Bancke, where the robbery was. They confessed; else it might have been thought that the English mariners took her away. 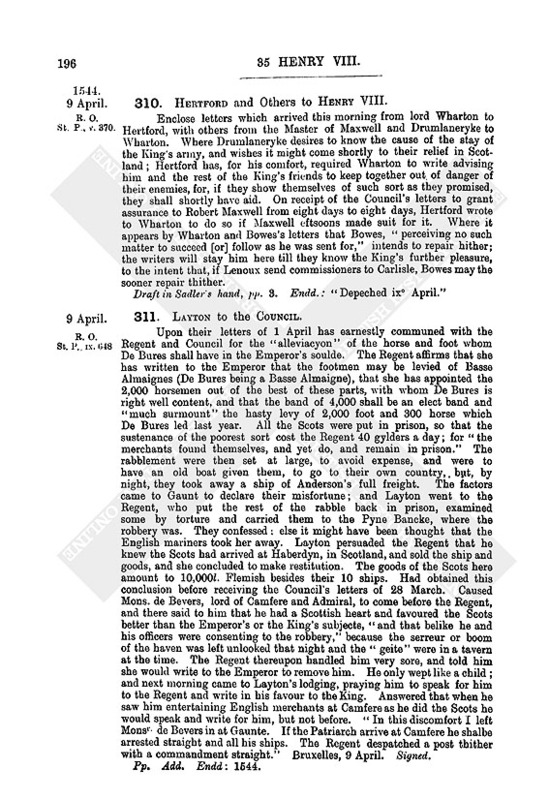 Layton persuaded the Regent that he knew the Scots had arrived at Haberdyn, in Scotland, and sold the ship and goods, and she concluded to make restitution. The goods of the Scots here amount to 10,000l. Flemish besides their 10 ships. Had obtained this conclusion before receiving the Council's letters of 28 March. Caused Mons. de Bevers, lord of Camfere and Admiral, to come before the Regent, and there said to him that he had a Scottish heart and favoured the Scots better than the Emperor's or the King's subjects, "and that belike he and his officers were consenting to the robbery," because the serreur or boom of the haven was left unlooked that night and the "geite" were in a tavern at the time. The Regent thereupon handled him very sore, and told him she would write to the Emperor to remove him. He only wept like a child; and next morning came to Layton's lodging, praying him to speak for him to the Regent and write in his favour to the King. Answered that when he saw him entertaining English merchants at Camfere as he did the Scots he would speak and write for him, but not before. "In this discomfort I left Monsr de Bevers in at Gaunte. If the Patriarch arrive at Camfere he shalbe arrested straight and all his ships. The Regent despatched a post thither with a commandment straight." Bruxelles, 9 April. Signed. 312. Wotton to Henry VIII. 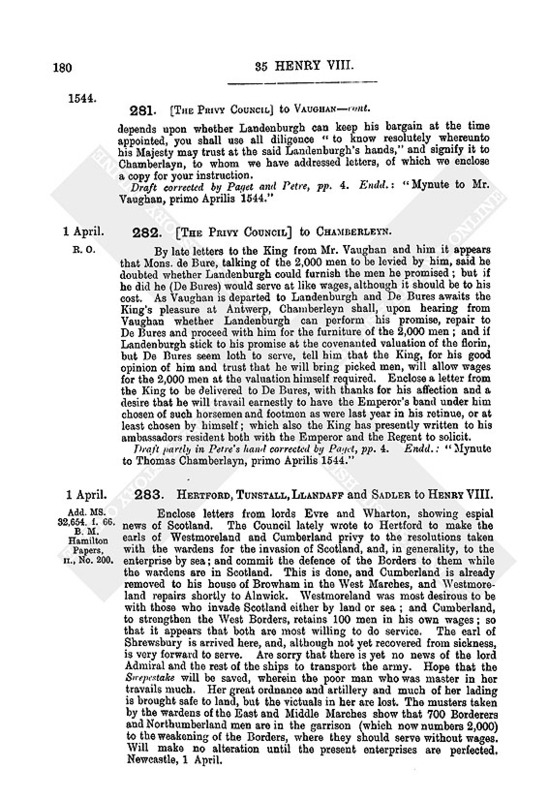 On 31 March received letters from the Council, both by Mr. Vaughan and by Nicholas the courier. Had procured Chr. Landenbergh to be here and Mr. Vaughan spoke with him, who varied somewhat from his agreement. Reports news given him by Granvelle on the 2nd inst., viz. :—The States have granted the Emperor 24,000 footmen and 4,000 horsemen, to be employed against the Turk and the French as shall seem best; and the Emperor has agreed to give the king of Romans 8,000 footmen and 1,000 horsemen of them to defend Hungary. The Empire does not deliver the men (who might do as much good as they did before Buda) but money to pay them. So few are appointed for Hungary, because the Turk has only 10,000 men in garrison there and cannot bring an army this summer. Also the States have written to the Switzers not to assist the French king. Granvelle will travail to pacify the Emperor with the king of Denmark, and in their conclusions Henry shall have honorable mention as the Emperor's chief friend; and Denmark must renunciare Diabolo et pompis ejus, that is, must renounce leagues with the French King and send him his Order again. When Winchester was here most of the Princes favoured the French king, but now none dare name him; for now, instead of hastening to depart, the Emperor says he will never return to Spain till the end of his wars with the French king. The Bishop of Rome dare not stir, because the Emperor told Cardinal Farnese that he would take anything done against Henry as done against himself. 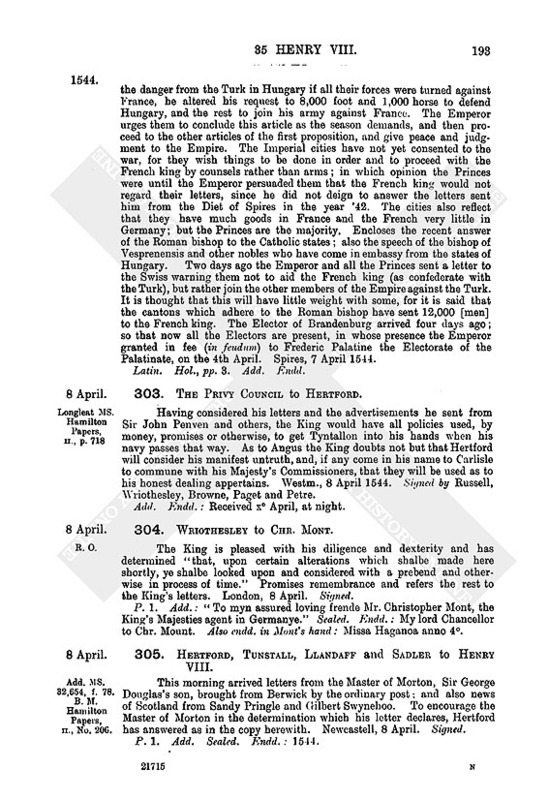 The States are now minded to require the Bishop to declare the French king enemy; not that they reckon to obtain it, but to make him favour the French king less. When Cardinal Farnese returned to Home, the Bishop would not read his answer in Consistory, but only said "that the Emperor had shut the gates of peace." However, the Emperor's ambassador so spread the answer abroad that at last, for shame, the Bishop had it read in Consistory. The Emperor's soldiers on the frontier play the very butchers, hewing in pieces all persons going towards France. The States will make a statute that Germans serving the French king shall now come home, or "their houses shall be thrown down and their wives and children sent after them." The Emperor retained all his captains three weeks ago, but keeps it secret and moves his artillery about, as to Gand and elsewhere, so as to confuse the French king. Thinking to learn something of the Emperor's intent, observed that, now the Emperor had obtained all his requests, he trusted they would shortly go down from this rude country to pleasant Brabant again; but Granvelle "had me straight" and said "Ah, you may not ask me that question, for I may not answer you," but you may write that the Emperor will temporise here awhile and intends to follow your Highness's counsel in entering into France. This answer is dark to Wotton but may be light to Henry if he has given such counsel. The French king bears a good countenance abroad, but, in secret, walks up and down saying to himself "Foy de gentilhomme! seray je prins prisonier encoire une fois? Perderay je mon Royalme? Seray je tue? Moureray je? With other like words, as a man vehemently troubled in his mind." The French say they will give battle in Piedmont but Guasto is going to revictual Carignane and believes they will not abide his coming. Far from revictualling Picardy and Luxembourg, the French send all they can make to Piedmont, whither Brisac is ridden in post. On the 4th inst., Frederic count Palatine did homage to the Emperor and was admitted as Count Palatine Elector. Told Granvelle of Henry's wish to retain another captain and 1,000 horsemen, and he promised to speak at once with the Emperor; but it was not until the 7th inst. that Granvelle showed him that the Emperor had appointed a pensioner of his, named Hanze van Sickenghen, whose father Franciscus was "as famous a captain as any was in Germany in our days." As he talked with Granvelle, Landenbergh came in; and, conversation turning upon the place of musters, Granvelle named Andernaken upon the Ryne. Wotton said that was too far, and "he" had already appointed Maistricht, but Granvelle said that country had been too much oppressed with soldiers and the people were seditious, and all Juliers had been spoiled and was too bare for soldiers to lie in. Meanwhile came in Hanze von Syckenhen, to whom Granvelle showed that the Emperor had appointed him to serve the King. He replied that he was ready, but would require assurance for the payment of his wages. Thought the request strange, but Granvelle explained that Duke Maurice of Saxon and others had required the like, and the Emperor had given his bond to every colonel. Misliked most this captain's face, which is "so red and fiery and garnished with rubies as it may well appear that his mother never taught him to water his wine." Reported the result to Granvelle, who swore that he knew of no captain by whom Henry could be better served, and seemed to think Wotton should trust him with the 10,000 gyldens. Has not done so; but as time passes, if he can (by the Emperor's advice) find a captain who will serve without this assurance of towns, he intends to take him. It will be hard to get so many barded horses. The Emperor requires but 50 in a 1,000. As for "arcabusiers," they can bring twice as many. The Emperor's petty captain of "arcabusiers" has great wages. The Emperor, Granvelle and De Lyre labour to have their men and Henry's at the same wages, to prevent grudging. Noted that Granvelle used Landenbergh and the two brethren of Sickenghen very gently, putting off his cap, taking them by the hands, "and bidding them once or twice to be covered, howbeit that they did not so." Mr. Vaughan is now at Francford to receive his money and pay Landenbergh. Encloses copies of the Emperor's entertainment of horsemen and footmen, in Dutch,—as there was no time to translate them. De Lyre says it is the same as last year save that, instead of paying but half a month from the breaking up of the army, he now is bound to pay a whole month "or else to pay as was paid for the conduct money." Encloses also De Lyre's letter that came with them. As the copy of the entertainment of horsemen was delivered at Mr. Vaughan's coming, it was turned into Latin by Chr. Monte (whose services Wotton commends); which translation also goes herewith. Spyre, 9 April 1544. Signed. 313. Jehan de Lyere to Wotton. Sends at his request the "retenues" both of footmen and horsemen, with the wages of colonels of foot and of marshals and chiefs of horse; "aussy les bestel et artickel brieff des gens de pied, sur lesquelz les pietons sont acoustume de jurer; quant a la retenue des gens de cheval, elle vous fust consignee par moy sur Monsr. de Grandvelle, et avons, selon icelle, conclut avecq les princes et aultres capitaines desdits gens de cheval, excepte que, a cause qu'il faisoient difficulte de prendre ung demy moys pour la retraicte, nous avons conclut avecq eulx que, quant il plaira a sa Majeste de leur donner conge, il demeurera en la liberte d'icelle de leur donner ung moys de gaiges pour leur retraicte, ou autant par jour pour leur retournee comme pour leur venue, compte six batz par jour." Would have sent them translated, but for haste. "De mon logiz, ce ixe d'avril 1544." French. Hol., p. 1. Add. : A Mons., Mons. l'ambassadeur du Roy d'Engleterre. Endd. : to Mr. Wootton. 314. The Privy Council to Hertford. The King meant, before Hertford left, to fortify Lythe, and, since Hertford's departure, devised with the lord Admiral to fortify a hill near Edinburgh, towards Lythe, under which Angus lay at his last assembly against the Governor. Considering the King's purpose to invade France this summer in person, the principal cause of his sending the army into Scotland was to devastate the country, so that neither they nor any sent thither out of France or Denmark might invade this realm. Angus and others standing bound to serve him otherwise than they do, the King had reason to think he might easier fortify and revictual these places, they giving hostages therefor (which Hertford was appointed to take at his entry) but as Angus and others have now traitorously revolted to the Governor and Cardinal's faction, the foresaid two places which were to be fortified (standing in the heart of that realm and only to be victualled by sea, which, the wind being so uncertain as experience shows, cannot always be done, nor done without "inestimable charge") might be recovered by the enemies, to the detriment of the King when he has better opportunity to invade, as he intends to do next year. Hertford shall, therefore, forbear fortifying the said places, and only burn Edinburgh town, and so deface it as to leave a memory for ever of the vengeance of God upon "their falsehood and disloyalty," do his best without long tarrying to beat down the castle, sack Holyrood House, and sack, burn and subvert Lythe and all the towns and villages round, putting man, woman and child to fire and sword where resistance is made; then pass over to Fifeland and extend like destruction there, not forgetting to turn upside down the Cardinal's town of St. Andrews, so "as th'upper stone may be the nether and not one stick stand by another," sparing no creature alive, especially such as be allied to the Cardinal, and, if the castle can be won destroying it piecemeal. By a month spent thus this journey shall succeed most to the King's honor, the army's surety and the saving of expense. He shall take order with the Wardens on the Marches to burn and destroy to the uttermost, not leaving Jedworth behind if it may be conveniently destroyed. The laird of Nesby's offer to serve, and to lay one of his sons in pledge, is to be accepted; but, seeing the falsehood of the Scots and "how little they pass on their pledges," he is to be trusted only so far as his deeds give cause, and his pledge is to be taken with this condition that if he fail to serve truly his pledge may be "justified." Order is to be taken with the Wardens that the borderers in Scotland may be still tormented now in seed time; for if not suffered to sow their ground they shall, by next year, be unable to live. Westm., 10 April 1544. Signed by Norfolk, Suffolk, Russell, Essex, Winchester, Westminster, Wriothesley, Gage, Browne, Wyngfeld, Paget, Petre, Bakere. 2. Copy of the above. Pp. 4. Endd. by Paget. 315. Hertford, Tunstall, Llandaff and Sadler to Henry VIII. Enclose letters to Hertford from Wharton showing that Glencarne and Bisshop, Lenoux's secretary, are coming by sea to the Isle of Man, and so to Carlisle, to treat upon the matters which the King appointed. Whereupon order is taken for Mr. Bowes, who is here, to be at Carlisle at Glencarne's arrival. 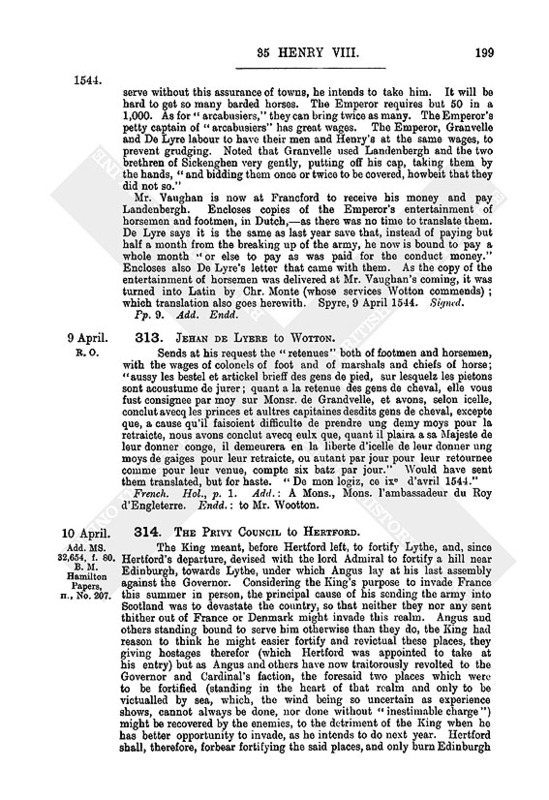 The commission and instructions to Wharton and Bowes are to treat with Lenoux, Angus, Casselles, and Glencarne jointly, and cannot serve now that Angus is apprehended. Mr. Bowes desires instructions therein. Enclose also another letter to Hertford from Wharton, showing the number of Border horsemen meet to serve in. the King's journey into France, and his own desire to go with them; wherein the writers beg the King to answer him. Newcastle, 10 April. Signed. 2. Original draft of the above, in Sadler's hand, noted in Hamilton Papers, II. p. 719, as endorsed "Depeched xo Aprile, at iij at after none." n1. The original passage altered from "the Regent and Council of the Low Countries have moved." n2. This minute was evidently drawn in March, although the letter was not sent till 1 April. n4. Of the Order of the Toison d'Or. n5. The State Papers print this with the heading "Dorthe to the Privy Council," and assign it to the year 1543.
n7. An English translation of what follows is printed in Archæologia XXIII., 348.
n8. Sabado. Not "Sunday," as it is translated in the Archæologia. n9. Apparently the writer here describes Lady Margaret, daughter of the Queen of Scotland and earl of Angus, as two persons. n10. Sabado de Ramos, Not Palm Sunday itself, as in the translation. n11. The postscript, also in Sadler's hand, has become detached and is now among the Hatfield MSS., Vol. 231 (bound after No. 31), but does not seem to be noticed in the Calendar of Cecil MSS. n12. So in MS., but the 28th March was a Friday. n13. Misread "Derrule" in Rymer.